The evolution of cooperation in South Italy. there looks to be some kind of concurrence between the Aeolian Islands and the litle harbour of Milazzo in Sicily, where most boats and airfoils start their transfers to the islands. I experienced a few times that boats for some unknown reason did not depart to the islands. It happened to me that I had to stay overnight on Christmas Eve in Milazzo instead of being home on my island. the weather wasnt to bad for the last boat to make the transfer. People explained that the personel decided to stay at home as it was Christmas. The hotel where I stayed overnight was happy to have a few rooms rented out. A troup of photographer and photmodels planned to come to Vulcano to make a photo session a few days ago. They had to renounce as the same boat company canceled the departure. Did the boat staff made a favor to the Milanese hotels? On the long run, I would say absolutely not. Nobody earns in the long term with destructive actions and unfair competition. If the islands miss visits, Milazzo restaurants, shops and bars in Milazzo loose money. And in the long run they will not even have beds sold with bad weather. 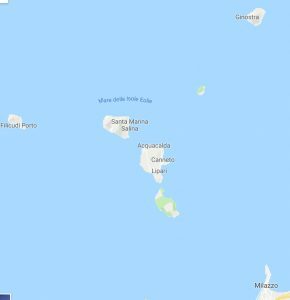 I would think that if I am in Catania, I would go to Syracuse where I have friends, instead of taking the risc to stay overnight in Milazzo. For the Milazzo people it should not be difficult to understand this. The Milazzo hotels have their own tourist share when the adverse sea helps them. But is that enough? It is good they take care of the tourists and island inhabitants. But why be happy with that? With inteligence and local area cooperation Milazzo can do a lot. 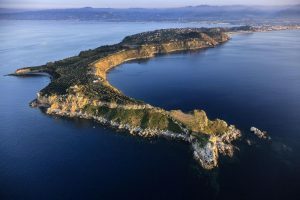 Look at the photo above of CApe Milazzo. I also imagine a lot of nice trecking possibilities in the mountains between Etna and Milazzo if they prevent the woods from getting burned during the summer season. Sicliy is indeed wonderful and can attract a lot of Tourism. Look at Palermo in October when the hotels were all booked. People from northern Europe like me do their best to flee from the winter darkness to get some sun. Sicily and the Aeolian islands can offer that. I have the last ten years spent my Christman and New Years Eve in Siclity and Lipari enjoying a lot of trecking and even New years Eve Swim in the Tirrenean sea that has Swedish summer water temperature. 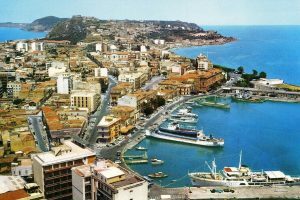 But they should not forget that the Milazzo inhabitants can do a lot to develop their local tourism too with the beautiful beaches they have, with the Milazzo Castle and promontory and its bronze age settlements. Hotel owners in Milazzo and on the Aolian islands should met and share knowledges and ideas how to develop the MIlazzo – Barcellona area.If someone has made errors and is not a Christian hypocrit, ask for forgivness and reopen the doors for a constructive dialog. Milazzo needs the Aeolian Islands. The Aeolian islands needs Milazzo.